4What is the Scientific Method? Whilst there are always minor variations between different scientific disciplines, they all follow the same basic path. The starting point of most new research is to formulate a general question about an area of research and begin the process of defining it. This initial question can be very broad, as the later research, observation and narrowing down will hone it into a testable hypothesis. For example, a broad question might ask 'whether fish stocks in the North Atlantic are declining or not', based upon general observations about smaller yields of fish across the whole area. Reviewing previous research will allow a general overview and will help to establish a more specialized area. Unless you have an unlimited budget and huge teams of scientists, it is impossible to research such a general field and it needs to be pared down. This is the method of trying to sample one small piece of the whole picture and gradually contribute to the wider question. The research stage, through a process of elimination, will narrow and focus the research area. This will take into account budgetary restrictions, time, available technology and practicality, leading to the proposal of a few realistic hypotheses. Eventually, the researcher will arrive at one fundamental hypothesis around which the experiment can be designed. 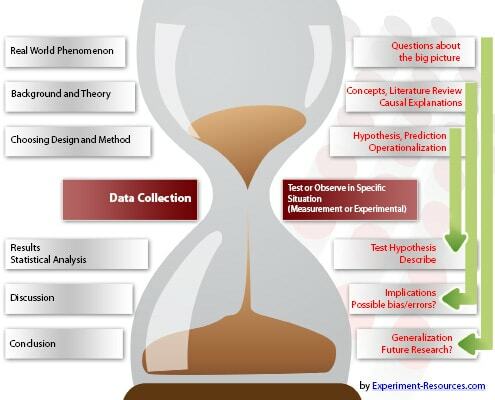 This stage of the scientific method involves designing the steps that will test and evaluate the hypothesis, manipulating one or more variables to generate analyzable data. The experiment should be designed with later statistical tests in mind, by making sure that the experiment has controls and a large enough sample group to provide statistically valid results. This is the midpoint of the steps of the scientific method and involves observing and recording the results of the research, gathering the findings into raw data. The observation stage involves looking at what effect the manipulated variables have upon the subject, and recording the results. The scope of the research begins to broaden again, as statistical analyses are performed on the data, and it is organized into an understandable form. The answers given by this step allow the further widening of the research, revealing some trends and answers to the initial questions. This stage is where, technically, the hypothesis is stated as proved or disproved. However, the bulk of research is never as clear-cut as that, and so it is necessary to filter the results and state what happened and why. This stage is where interesting results can be earmarked for further research and adaptation of the initial hypothesis. Even if the hypothesis was incorrect, maybe the experiment had a flaw in its design or implementation. There may be trends that, whilst not statistically significant, lead to further research and refinement of the process. The results are usually published and shared with the scientific community, allowing verification of the findings and allowing others to continue research into other areas. This is not the final stage of the steps of the scientific method, as it generates data and ideas to recycle into the first stage. The initial and wider research area can again be addressed, with this research one of the many individual pieces answering the whole question. Building up understanding of a large area of research, by gradually building up a picture, is the true path of scientific advancement. One great example is to look at the work of J J Thomson, who gradually inched towards his ultimate answer.